Join WDG Around DC This Week! It’s a busy week for WDG! If you’re in DC on Thursday and Friday, stop by one of our events! 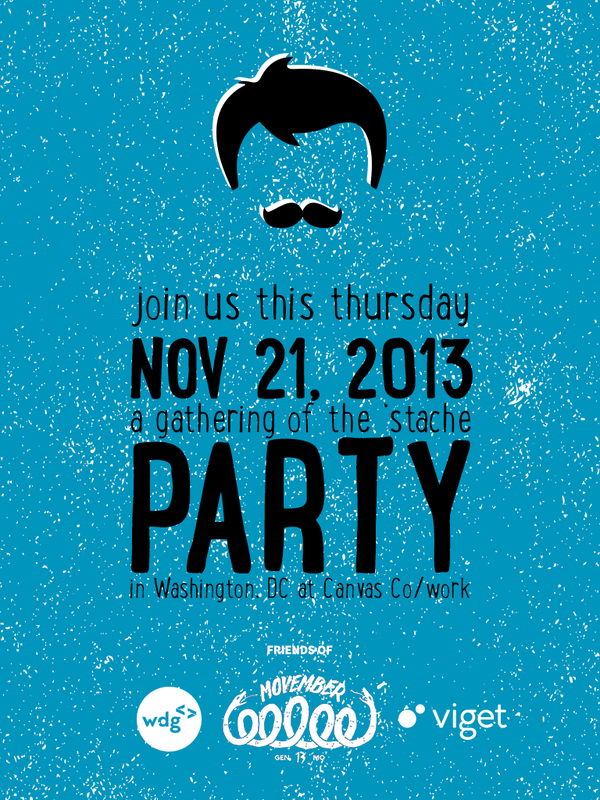 This Thursday, 11/21, WDG is hosting a party at Canvas Co/Work in DC to benefit Movember and its mission to battle men’s cancer. The party starts at 7pm and prizes will be awarded to the most stylish ‘staches. Grab your free ticket & join WDG, Viget and Threespot for a night supporting an awesome cause. Can’t make it but still want to support our fundraising efforts? Donate to our team’s Movember page! WDG is sponsoring this month’s Creative Mornings in DC and it’s going to be a great talk on Friday. Jason Steinhauser, from the Library of Congress, will be speaking on this month’s theme – Bravery. Don’t have a ticket? Put your name on the wait list for a chance to join us at Gibson Guitar Showroom in DC. Want to stay in the loop on what WDG is up to? Follow us on Facebook and Twitter!